Picture a huge ballroom with 100 individual work areas, a couple hundred people, a overwhelming air of anticipation and the air conditioning cranked up high. And stick a 6-ft tall, costumed Pillsbury Doughboy in the corner of the room. 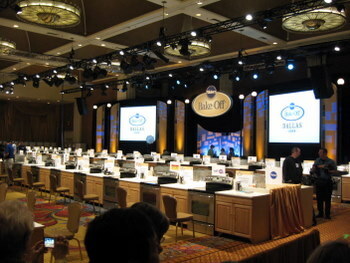 This is pretty much the setting for the 43rd annual Pillsbury Bake Off right before the 100 finalists come in to bake their potentially million-dollar dishes. The room is cold because as soon as those 100 ranges turn on and people start working, it gets pretty warm. The Bake-Off is the biggest and most famous baking contest in the country. The first one was held in 1949 and was changed to a biannual event from an annual one when the Pillsbury company was so overwhelmed with entries that it took them more than a few months to comb through all of them. Opinions are mixed about the contest because participants had to have their entries meet some specific criteria and use some specific ingredients. When the contest started, the categories were things like pie, cookies and yeast breads. These days, they’re more often appetizers, sweet treats and pizzas (they change every year). Flour, butter, sugar and eggs have always been eligible ingredients, but some of Pillsbury’s best-selling refrigerated products – biscuits, crescent rolls and pie crusts, for instance – are now acceptable. To some, these convenience ingredients represent some kind of baking shortcomings, but it is important to keep in mind that the Bake Off is not a contest to find the best baker in the US. It is a contest to use given ingredients in the most creative and original way possible. The participants in the Bake-Off are a very diverse group, and I don’t just mean that they come from different areas of the country, are of varying ages (27-72) and are from different cultural backgrounds. I mean that they are all cooks and bakers, most of whom were prompted to enter the contest to challenge their creativity and vie for the million-dollar grand prize, not because they necessarily have a great passion for using all the sponsored products. Some have organic gardens and grow most of their own fruits and veggies. Others regular work with their homemade sourdough starters. Most of the recipes here are semi-homemade with some convenience ingredients (although many took quite some time to prepare anyway), but only because that is the challenge of the contest. I saw plenty of top notch ingredients, from good proscuitto to Scharffenberger chocolate, on contestant tables when I walked around the contest floor this morning. It is a long process to getting a recipe accepted at the Bake Off. There are tens of thousands of entries. First, all of the recipes that didn’t follow the guidelines are eliminated. Did you know that some people think you’re supposed to send in your actual dish and not just the recipe? I heard some stories about receiving old (smelly, improperly stored – you name it) casseroles and such in the mail at the Bake Off headquarters. The remaining recipes are reviewed by food professionals, then they are tested and reviewed again. Researchers spend months going through cookbooks and checking online to see if ideas are original, then the remaining recipes are tested, tasted and retested until they are finally narrowed down to just one hundred recipes. Given the length of time and the rigor of the testing, it’s almost shocking to hear that some people have been finalists two and three times before. I say “almost” because the people who fall into that category are semi-professional baking contest entrants and are very talented at identifying trends, as well as at coming up with tasty dishes. The contest itself almost seems easy by comparison. Each of the contestants has their own kitchen area with a range, countertop and any variety of appliances that they might need to prepare their recipe. Each finalist has to make their complete recipe three times: once for the judges, once for photos and once for sampling. The three can be done in any order and each contestant has a bit of a strategy that they work by, whether they plan to give the judges the first batch so they’re hungry when they eat, or whether they reserve theirs for last so that it will be fresh in the judges minds when they deliberate. Most have prepared their recipes often enough to know what a “perfect” batch looks like and that is the one they end up sending to the judges. The samples are put out for sponsors and members of the press (I fell into that category here) to taste, as well as for the other contestants to sample. It was a tremendous amount of fun to be down on the floor while everyone was working. I enjoyed seeing how all the entered recipes were constructed and chatting with the finalists about how they came up with their recipes, why they entered the contest and what their strategies were. I sampled all kinds of things and I can honestly say that everything tasted really good. A couple that stand out in my mind as being extra tasty were the Mexican Chocolate Crunch Brownies (fugdy, wouldn’t have guessed a mix was used), Peanuttiest Peanut Butter Brownie Bars (tasted like candy), Chocolate Kissed Raspeberry Almond Crostada (looked and tasted like something from an upscale food magazine), Peach Chutney Pinwheels (cute appetizer, could be made with puff pastry, too), Chili Cheese Dog Pizza (sounds odd, but I really like chili dogs so it worked fine in my book!) and Mango-JalapeÃ±o-Chicken Salad in Cumin Tortilla Bowls (some of my favorite flavors and a classy presentation). So, yes, while some of the competing recipes do fall into the “semi homemade” category (Sandra Lee, pictured with me above, is going to announce the winner on April 15th), I guarantee that most of the participants in the contest do a heck of a lot more in the kitchen than making up only “semi homemade” recipes. They’re adapting their ideas to fit the criteria of the contest and, believe it or not, coming up with some really tasty recipes in the process. It’s inspiring to be here – not because I necessarily want to use crescent roll dough in my baking, but because everyone is really enthusiastic about baking, and trying new recipes and flavor combinations. Whatever ingredients you use, it’s always fun to talk about those things with people who share your (and my own) interests. I can’t call a winner for this year – they’re all winners in my book – but I can say that I am definitely going to try and come up with some fresh ideas when the next Bake Off contest rolls around for the chance to come out to the contest again. Update: You can check out the results of the Bake-Off here and see my version of the winning recipe here. Next PostNext 43rd Annual Pillsbury Bake Off Winners! How fun for you to attend, Nic! Just a correction – you are mistaken that flour, butter, sugar, and eggs have always been ingredients one could use for the bakeoff. The contest started with only flour. And there was a period of time fairly recently during which only convenience products were used -flour was not eligible! Anyways, it looks like fine, I’m looking forward to reading more posts. And I should also mention that while the products that are required to meet contest criteria are often convenience products, you have always been able to use items not on the list (usually only two are required). So you might use butter, eggs, etc. in conjunction with a pre-made product for the recipe you write. Hmmm, is meatloaf an ingredient? Like flour? ps – I love gravy and it loves me. Meatloaf should be an ingredient… although, truthfully, I’m not sure what the Pillsbury version of meatloaf would be. How about regular meatloaf with biscuits and gravy? Mmm…. Hey, I met you but I must not have looked at your name tag! Duh! I agree with you about the Crostada. I baked right behind her and I was amazed by how precisely she did everything. Her finished crostadas looked even better than the ones in the book. I wish I had tried them but I left the floor at noon — I was pooped. I’d like to try making them at home but I’m sure mine wouldn’t live up to hers. I also agree with you about the Mexican brownies — I didn’t taste them there but I made them at home and they were really good. I’m glad you mentioned that most contestants have skills that are well beyond using convenience products. Hi, I can’t understand how to add your site in my rss reader. How can I do this?